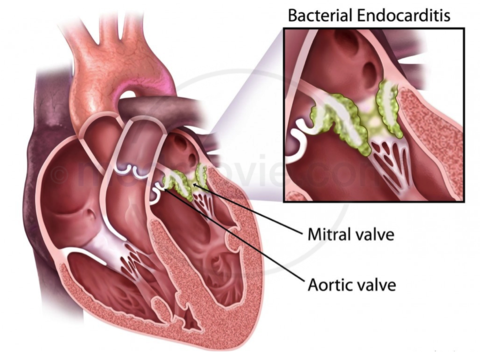 Home » Health » What Is Endocarditis? Endocarditis is an infection of the endocardium, the inner layer of the heart. This condition is generally caused by the entry of bacteria into the bloodstream, which then infects the damaged part of the heart. If this condition is not immediately treated, endocarditis can damage the heart valve, and trigger dangerous complications. In general, endocarditis is classified as rare, and does not attack someone with a healthy heart. However, this disease is prone to occur in individuals with certain conditions. For example, people with congenital heart disease, people with cardiomyopathy , and someone with a prosthetic heart valve. Symptoms of endocarditis can develop slowly in a matter of weeks or months ( subacute endocarditis ). It can also occur suddenly within a few days ( acute endocarditis ). It depends on the germs that cause the infection, and whether the patient has a heart problem. Chest pain especially when breathing. Shortness of breath, especially when on the move. Swelling of the legs or abdomen. Red spots accompanied by pain in the palms and soles of the feet. Red bumps under the skin, on the fingers and toes. Purple or red spots on the skin, the whites of the eyes, or in the mouth. Endocarditis occurs when germs enter the bloodstream and then to the heart. The germ then attaches to an abnormal heart valve or damaged heart tissue, and multiplies in the inner lining of the heart (endocardium). This condition triggers inflammation of the endocardium and damage to the heart valve. Mouth sores . There are injuries to the oral cavity when brushing your teeth too hard, dental procedures, or being bitten when chewing food, can cause bacteria to enter the bloodstream, especially if the cleanness of the teeth and gums is not maintained. Another infected person . Bacteria can enter the bloodstream and heart, from infected parts of the body, for example due to open sores on the skin, sexually transmitted infections , or infections in the digestive tract. Urinary catheter Bacteria can enter the bloodstream through a catheter, especially a catheter that is installed for a long time. Syringe. Contaminated needles can be a medium for the entry of bacteria into the bloodstream, either through tattoos, piercing, or using injectable drugs. Use of artificial heart valves. Suffering from congenital heart disease . Damage to the heart valve. Electrocardiogram (ECG). The ECG is performed to check for possible abnormalities in the patient's heart rate and rhythm, by measuring the heart's electrical activity. Blood test. Blood samples will be examined to identify the type of bacteria in the bloodstream and identify other medical conditions, such as anemia. Chest X-ray. Through chest X-rays, doctors can find out if endocarditis causes enlargement of the heart, or causes the spread of infection to the lungs. Echocardiography through the chest wall. This procedure is done by directing sound waves to the patient's chest, via an ultrasound device. This test helps doctors see the structure of the heart and see signs of infection. Transesophageal echocardiogram. In this procedure, the doctor inserts an ultrasound device into the esophagus (esophagus) so that the resulting image is more detailed, especially in the heart valve section. CT scan or MRI. This imaging test is done to check whether the infection has spread to other organs, such as the brain or chest wall. In many cases, patients with endocarditis are successfully treated with antibiotics. Whereas in some other cases, surgical procedures need to be done to repair damaged heart valves and clear the remaining infection. The type of antibiotic given to treat endocarditis depends on the type of germs that cause the infection. Therefore, the patient's blood sample will be examined first to get the right combination of antibiotics. Generally, patients will be given injectable antibiotics while in the hospital. Treatment can last 2 to 6 weeks, depending on the severity of the patient. If the condition has improved, the patient can continue antibiotic therapy at home. However, patients are advised to routinely control the doctor to make sure the treatment is going well. Even though they are undergoing treatment, some symptoms can appear as a sign that the infection is getting worse, or due to the reaction of antibiotics used. Immediately go to the doctor if symptoms of shortness of breath and swelling in the legs arise, which gets worse. These symptoms can be a sign of heart failure . Surgery is performed on endocarditis infections that have lasted a long time, or in endocarditis caused by fungal infections . Surgical procedures are performed to remove dead tissue, fluid buildup, and scar tissue from the infected area. The doctor will also carry out surgery, if the condition of the patient's heart valve is damaged. Depending on the patient's condition, the doctor can repair the heart valve or replace it. Replacement valves can be with biological valves made from animal heart tissue, or synthetic mechanical valves. The patient has a prosthetic heart valve. High fever still continues despite antibiotic or antifungal therapy. Endocarditis is caused by an aggressive type of fungus or bacteria that is resistant to antibiotics. Blood clots arise, even if you are on antifungal therapy or antibiotics. An abscess or fistula (abnormal channel) is formed on the inside of the heart, which is known from the results of the echocardiography test. Disorders of the heart, such as heart noise, heart valve damage, and heart failure. The formation of an abscess (collection of pus) in the heart, brain, and lungs. Endocarditis can be prevented by maintaining dental hygiene. Cleaning teeth with brush or dental floss, and routine dental check-ups can prevent germs from appearing in the mouth and entering the bloodstream. If you are at risk of developing endocarditis, tell the dentist. The doctor may give antibiotics before undergoing an examination. In patients with a history of endocarditis, heart surgery, or cardiac abnormalities, it is necessary to be aware of symptoms of endocarditis, such as a fever that lasts a long time, the body is weak without cause, and open wounds that do not heal. Another preventive step is to avoid behaviors that can trigger skin infections. For example, making tattoos, body piercing, or abusing injections. 0 Response to "What Is Endocarditis?"